Instead of always feeling like you want your kids to eat their greens, drink them up instead with this green monster smoothie! Frustrated that your kids won't eat their greens? Ever try drinking them? 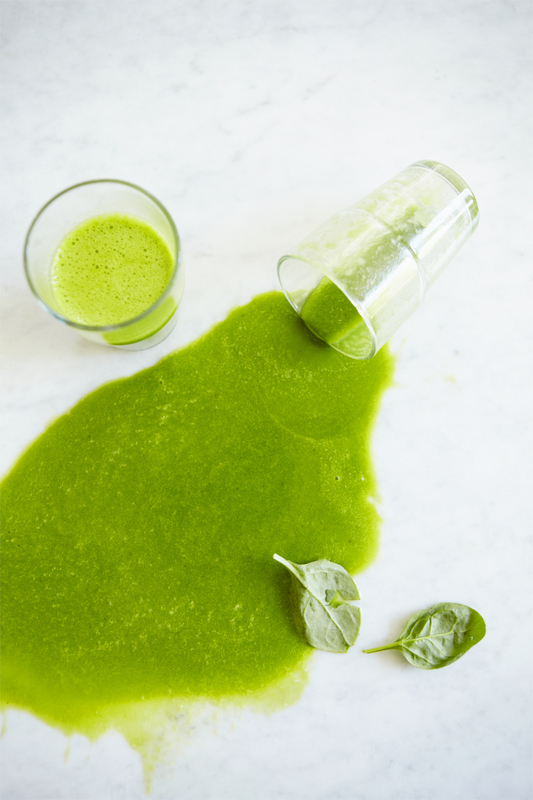 This Green Monster (aka Spookie) Smoothie, also featured in my new book, is my foolproof solution. 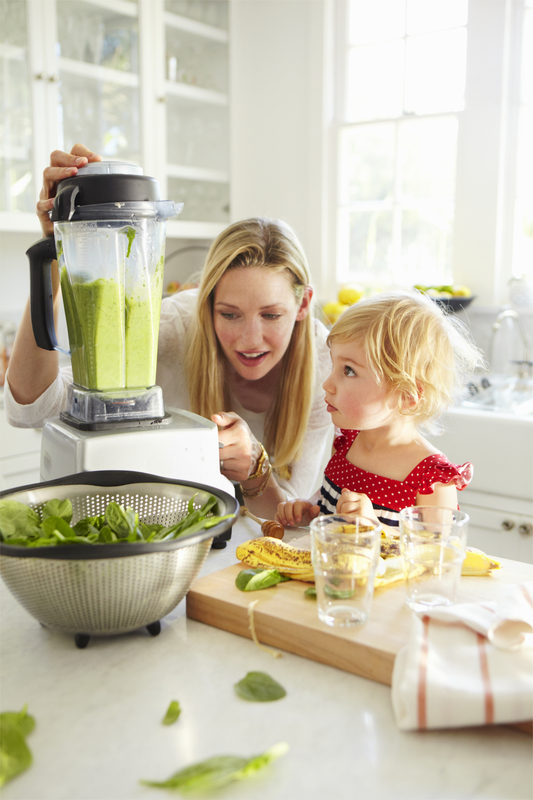 Get your kids making these healthy and delicious drinks with you and when it comes to mealtime, green may start being their most favorite color! 1. Place all the ingredients in a blender and puree on high for 1 minute until smooth. YUM! I love making my boys smoothies and I always put spinach in, but I think I am going to put a little more and make a GREEN one having spinach be the highlight! You have the best ideas, thank you so much, I am going to try this one tonight. Is there anything that I can use instead of honey? My son is 19 months and I don't think he should have honey yet. You could use agave syrup or really any liquid sweetener you prefer! Ive made this before, and my son is 16 months. We left out the honey, and didn't sweeten it with anything, and it tastes great! YUM! I think my husband would even eat it! Cat that is exactly what I do for my toddler... fresh juice! WyWy, yes, it is full of Vicpigpigcorner, thanks dear.Mei Teng, do try out, very rernishefg.Cinnamon girl, thanks for your caring.mysimplefood, you should eat more since US selling so cheap.Nina, Thanks.kichen queen, thanks for stopping by.Bo, ya, you are right. Thanks.Wendy, hahaha, i asked my daughter to do for me.meemsync, thanks.tigerfish, quickly try out. This is great! I can't wait to try it out for my boys but how much Spinach is used? I have this recipe marked in the cookbook. I've been meaning to make it with all the chard in the garden. I might go pick some now so I can have one in the morning! Hi there! Can you share what type of blender you use here? We have a dangerous blender we need to replace but want to be able to make smoothies like the green monster one here! Since the girls like to help me make it, we are looking for a safe and sturdy blender like you use in the video. Thanks!! Tried this recipe tonight; my 5 year old did not like it, but my nearly 2 year old took several sips and seemed to enjoy it. I made one smoothie with regular whole milk, and another with unsweetened almond milk (the only plant milk I had on-hand); I will definitely try it with rice milk next time per your suggestion! I used my Magic Bullet and it had no problem with the greens, but I did have to halve the recipe to get it to fit. It was so easy to make that I wasn't even disappointed when my 5 year old wouldn't drink hers, so I'd definitely recommend people to give it a try. I made this in my Magic Bullet tonight for myself and my almost 5-year old who loves spinach. I mistakenly grabbed Silk soy milk at the grocery store instead of rice milk, and my bananas weren't as ripe as they could have been, but I digress - I offered my daughter a sip from my glass and she took off with it and wouldn't give it back, she downed the whole thing! I halved the recipe and it was more than enough for the 2 of us. I couldn't convince my non-spinach liking hubster to try it, even though we promised him it tastes like banana. Next time I'll try the rice milk, and use a frozen banana that's on the very ripe side. This recipe is definitely a keeper! Can I give this smoothie to my 13 months old son?. This should be okay for a 13 month old! Especially if you've already tried all the ingredients with him separately! My 18 mo old daughter eats really well at the sitter. But I have a terrible time getting her to eat the same way/things at home. Dinner is a constant battle. . She loves her fruits, yogurt, crackers etc. but when it comes to veggies and meatspace even potatoes and pasta, forget it! She will eat organic pouches of greens, but not the solid version. I love to cook and want my daughter to enjoy food at home. Help! My kids love this. They ask to watch this video and then make the smoothie. They like to help me make it and say \"Green Monster movie!\" Even my 2 year old who hardly drinks fruit smoothies drinks this. I feel so good that they are getting a good dose of a healthy veggie. Thank you, thank you, thank you! My 3-year-old daughter who NEVER wants to eat any veggies just watched this video with me and instantly wanted to make a Green Monster Smoothie. She wanted to add grapes, so we did and she is drinking it up as we speak. I was so happy I almost cried! Nice video! Do you think my son, who is 1,5 year old can eat raw spinach? Is there any option since he already hate veggie :(? 1.5 years is old enough to introduce raw spinach! Of course, check with your pediatrician!